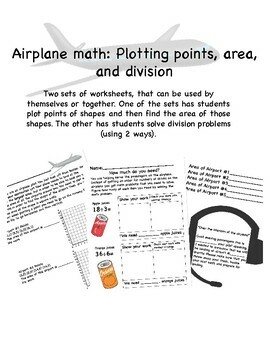 Two sets of worksheets, that can be used by themselves or together. One of the sets has students plot points of shapes and then find the area of those shapes. 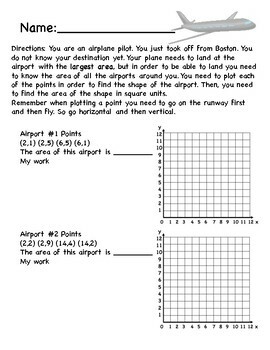 For this part of the packet the theme is that they are a pilot and know they are landing at the place with the biggest airport, so they need to find the area of all of the airports, so that they know where to land. The other has students solve division problems (using 2 ways). 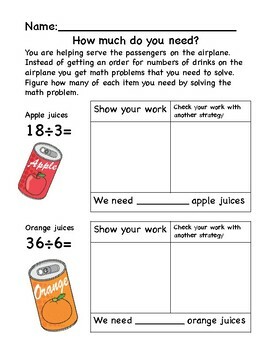 For this part of the packet the theme is that they are on the plane and need to get drinks for passengers and need to figure out how much of each drink they need.